One of the simple car maintenance procedures that you can certainly do yourself is checking your car’s oil. The process is simple and straightforward, you won’t need tools to do it. All you would need is the dip stick that is included with your car. Step 1: Turn the car off and let it sit idle at level ground for a few minutes before checking the oil levels. Warning: Oil doesn’t just stay in the oil pan. It gets distributed throughout the engine during your car’s operation. So if you check the oil level right after a drive, there would still be oil left in the inlets of the engine compartment, thus, you won’t get an accurate reading. 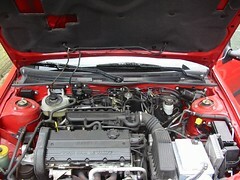 Step 2: Open the hood and look for oil cap and dip stick. Warning: The location of the oil cap and the dipstick is different for different vehicle models. To determine where these are located, consult your vehicle owner’s manual. You can find your manual online by going to your car manufacturer’s site. Step 3: Wipe the dip stick with a rag and insert it into the oil reservoir. Warning: You need to wipe the dipstick clean to get an accurate oil level reading. Also, you don’t want dirt and other particles contaminating the oil. Once the oil is contaminated, it can cause unnecessary wear and tear on your engine components. Step 4: Check the oil level. Look for the markings or engravings on the dip stick. If it’s below the markings, the oil level is low and you need to put in more oil. Warning: Better get the right oil for your vehicle. There is no generic oil for all vehicles because different vehicles have different requirements from their oil. To know which oil to get, better consult the owner’s manual of your vehicle. Step 5: Pour new oil in small increments until the level reaches just the tip of the engravings on the dipstick, if you need to. Warning: Too much oil is just as bad as too little. You run the danger of flooding the engine with oil. Step 6: Just work your way back and your done. Constantly checking your car’s oil level help protect your engine from wear and tear and overheating. As oil reduces friction in your engine, it helps make your engine components last longer so your engine perform better. What’s more, checking the oil level is easy and won’t take much of your time. Car Overheating Problems – Cars and problems related to cars. Most people deem checking the oil levels of their cars rather pointless and unnecessary. Little do they know that neglecting to perform such maintenance would jeopardize their car’s engine, putting it in unwanted and unnecessary stress which could lead to severe damage. Are you one of those people? Then try to change your outlook, try to value your car’s health more, treat it like your own body and check its oil levels at least twice or thrice a month to ensure that it is properly oiled and in good shape. Take good care of your car and it will do the same for you. Consult your car’s manual or search online about what motor oil does you car run on. Stick to that kind of motor oil. It is not a good idea to experiment with other motor oil. Also, be consistent on what brand of oil you use for your car. It is not ideal to mix different types of oil in your engine since other motor oil have something added to them to distinguish them from other brand.